My 670 are beating my 980s. Not sure what to try? Message 1896156 - Posted: 19 Oct 2017, 16:27:20 UTC - in response to Message 1896115. You are running a CUDA 3.2 app which is incompatible with Maxwell cards like your 980. You would need to run at least the CUDA 50 app or better still the SoG app. I would run the Lunatics installer again and this time not let it select defaults. You need to make the choice yourself for the SoG app in the menu. setiathome_CUDA: device 1703268 is Maxwell or newer generation, 5.x compute compatibility or higher. Cuda 3.2 or lower doesn't support these. Message 1896189 - Posted: 19 Oct 2017, 19:47:02 UTC - in response to Message 1896156. I reinstalled. How can I check again? Message 1896198 - Posted: 19 Oct 2017, 20:24:30 UTC - in response to Message 1896189. What you should look for is the application called out as the OpenCL version by Raistmer. Version should be r3557 as installed by the Lunatics installer when choosing the SoG app in the installer menu. I just looked at your latest tasks and I still see the CUDA32 app, so you didn't make a choice again and let the installer install the defaults. You have to select the CUDA50 or the SoG button on the Nvidia MB app select page. The installer defaults to CUDA32 if you make no other choice. I assume you are referring to this machine hostid=7368589 as it is the only one I see with a GTX 980. Message 1896405 - Posted: 20 Oct 2017, 19:36:08 UTC - in response to Message 1896115. You should add -sbs 1024 -period_iterations_num 10 to your command line text file to speed up a little more. Make sure its in the same line. Simple question fir Mike please. Is the R3584_SOG for Nvidia on your Mikes World website any faster that the R3557_SOG installed by Lunatics 0.45 Beta 6. If so are there any timelines for Lunatics installer to use R3584? Message 1897573 - Posted: 26 Oct 2017, 16:04:51 UTC - in response to Message 1897570. As I understand it, no. The r3584 was introduced for the lesser cards improvement. On the faster cards r3557 is supposed to be faster than r3584. I wouldn't expect the r3584 app ever to show up in the Lunatics installer if and when Richard ever decides to write a new installer (slim chance) or some other developer takes on the Lunatics installer project. Message 1897578 - Posted: 26 Oct 2017, 16:16:52 UTC - in response to Message 1897573. 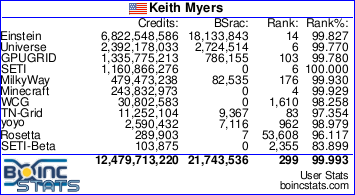 I know Richard has a new Boinc project support role, but I'd be sorry to see him lose his installer slot.